Born September 22, 1957 (Minneapolis, MN) the University of Wisconsin's all-time leading goal scorer, Mark Johnson helped the Badgers to the 1977 NCAA Championship as a freshman. Johnson, the leading scorer on the 1980 "Miracle on Ice" U.S. Olympic Team, notched two goals against the Soviet Union to help the team to the gold medal. Johnson had an 11-year NHL career that included an All-Star Game appearance and a captaincy with the Hartford Whalers, as well as stops with the Pittsburgh Penguins, Minnesota North Stars, St. Louis Blues and New Jersey Devils. Following a stellar pro career, Johnson, like his father - 1993 Hall of Fame inductee Bob Johnson - started a successful coaching career. 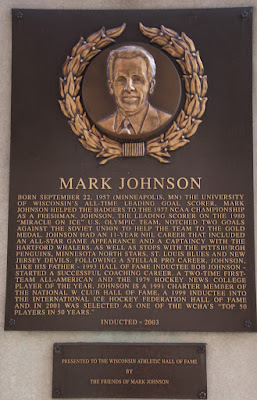 A two-time First-Team All-American and the 1979 Hockey News College Player of the Year, Johnson is a 1991 charter member of the National W Club Hall of Fame,a 1999 inductee into the International Ice Hockey Federation Hall of Fame and in 2001 was selected as one of the WCHA's "Top 50 Players in 50 Years."